As we’ve discussed here before, Republican Presidential candidate Michele Bachmann doesn’t care for the gays too much. Well, a few days ago, Rep. Michele Bachmann’s recently appointed Iowa campaign co-chair Tamara Scott had a little conversation with virulently anti-gay Bob Vander Plaats in which she makes the incredible leap from gays and lesbians marrying to someone marrying…wait for it…the Eiffel Tower. While I too am enamored by the Eiffel Tower – like many other adults, I understand that I cannot marry it. 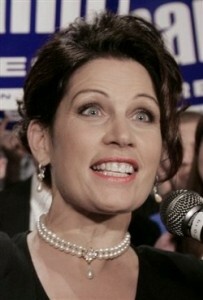 One can only hope that this idiocy will be the final nail in Bachmann’s candidacy (in which she’s now polling at 3-4%).